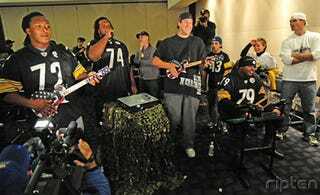 Members of the Super Bowl champion Pittsburgh Steelers engaged U.S. soldiers stationed in Iraq in a Guitar Hero battle, which would have been a heart-warming story if brickheaded quarterback Ben Roethlisberger hadn't called the game "Rock Band" on the teevee. Well, alright, maybe it's a heartwarming story anyway. The jamfest was put together by Pro vs. G.I. Joe, which arranges morale-booster multiplayer competitions between sports stars and service members overseas. Via Xbox Live and a satellite connection, Roethlisberger (git-tar, second from right), and his offensive line - Ramon Foster (guitar, left), Willie Colon (vocals) and Trai Essex (drums, looking like he's playing on easy) took their Guitar Hero 5 skills up against the Army's 336th Military Police Company. To be able to interact with these guys and enjoy it – and I could see the joy on their face – and get to beat them a little bit in some Rock Band. It's a lot of fun. Madden NFL 10 cover boy Troy Polamalu didn't play, but he did show up in grass-covered sniper camouflage (yes, really.) I bet Hines Ward's eyes got real big when he saw that, thinking that getup would be perfect for his next out-of-nowhere blindside hit on Keith Rivers.